Feeding your dog the best high fiber dog food is a sure way to keep him bright-eyed and bushy-tailed. Unlike cheaper diets, quality dog food does not consist of indigestible bulking elements that only makes your dog less healthy and demands more frequent poop-scooping. Similar to us, dogs who lack enough fiber in their diets are prone to many health problems including obesity, irregular bowel movements, constipation, gas problems, etc. Love them as we do, nobody enjoys the company of a flatulent dog! It’s general knowledge that dogs are omnivorous, enjoying both meat and vegetables. You may have noticed how dogs may occasionally graze on grass to acquire additional fiber lacking from their diet. However, that won’t suffice and surely you cannot order a dog to eat a bowl of salad. The best way for Doggo to have his daily dose of fiber is by feeding him the best high fiber dog food. There are two kinds of fiber: soluble and insoluble. Insoluble fiber draws water into the intestine to prevent constipation, creating softer, larger stools that stimulate intestinal function. Likewise, it prevents diarrhea by absorbing excess water from within the intestine. In addition, a high fiber diet reduces your dog’s risk of acquiring colon cancer. It speeds up the process of elimination; thus, preventing carcinogens and other toxins from doing damage to your dog’s intestinal tract. Also, fermented soluble fiber creates a short-chain fatty acid as a by-product that fuel cells to repair the walls of the intestine. Fiber is a major element when it comes to proper weight management. Feeding your dog a fiber-rich dog food, which also contains plenty of protein and complex carbohydrates, ensures that he is well nourished and satiated without the unnecessary calories. Fiber makes your dog feel full fast and delays the stomach to empty. Fiber has similar effects in dogs as with humans: it allows your dog’s sugar levels to maintain within normal range. If your dog already has canine diabetes, it is vital that he follows a high fiber diet without fail. High Protein Content – Our canine companions are healthiest when they have a regular diet consisting a variety of fruits, vegetables, and meat. Dogs are not obligate carnivores but the bulk of their diet should come from protein sources. Protein from meat helps build strong, lean muscles. If your dog is allergic to poultry, you may opt for beef or fish. No Artificial Ingredients – High-quality dog food taste good even without artificial enhancers. Unless you opt for cheaper alternatives, artificial flavors or colors are completely unnecessary. While these ingredients aren’t exactly harmful, they may trigger allergies. 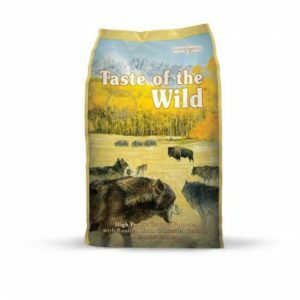 The Blue Buffalo Wilderness High Protein Grain-Free adult dog food is currently ranked the best high fiber dog food not only in this list, but also in the hearts of many dog owners worldwide. Its special formula mimics that of the ancestral diet of wolves: a generous amount of protein, adequate amount of carbohydrates, plus essential vitamins and minerals from plant sources. As for protein, the Blue Buffalo Wilderness adult dog food contains chicken meal, which is 300% more protein than fresh chicken; peas, which are 25% protein and rich in natural fiber; whole dried eggs for its high biological value; and salmon. Flaxseed is also added to augment salmon’s Omega-3 fatty acid content while chicken fat is added for its linoleic acid. Likewise, the Blue Buffalo Wilderness adult dog food contains a variety of fruits and vegetables to help promote your dog’s gut integrity with its high fiber content and antioxidant enrichment. Made without grains, its carbohydrate content is derived from sweet potatoes and peas. Also, this product does not contain artificial colors or flavors. As you can see, the Blue Buffalo Wilderness adult dog food is specially crafted with a precise blend of nutrients to boost your dog’s immune system, life stage requirements, and promote his overall health and well-being. Proteins and complex carbohydrates make sure he has a lot of energy to run and play, while antioxidants and essential vitamins keeps sicknesses at bay. Modern dogs may have become playful home-buddies, but science has proven that in spite of their adaptation to domestic life, our canine companions still share the same DNA with their wild ancestors. Hence, the modern dog’s diet should still adhere with what nature has intended for the ancient canine: plenty of protein, fiber, and other essential nutrients. Thankfully, dogs today don’t have to hunt to get a taste of the wild. The Taste of the Wild Grain-Free High Prairie Natural dry dog food ensures that your canine companion receives the nourishment he needs for optimum health. Each bowl provides a good deal of protein and complex carbohydrates to keep your active dog wide-eyed and bushy-tailed at all times. Worry not if you have a picky eater! Its recipe includes roasted bison, venison, beef, lamb, chicken and ocean fish meal, all of which makes it incredibly satisfying and nutritious. What is more, it contains garbanzo beans and peas: fiber-rich legumes that also contain carbohydrates and protein. This product is grain-free, making it ideal for the sensitive fur-buddies prone to allergies and GI issues. The Taste of the Wild Grain-Free High Prairie Natural is also fortified with vitamins and minerals to strengthen his defense against common illnesses. As its name suggests, the Earthborn Holistic Coastal Catch Grain-Free dry dog food allows your fur-buddy to enjoy the sumptuousness of herring, salmon, and whitefish while he reaps the health benefits it provides. All three seafood provides high protein content to help your pooch develop strong, lean muscles and sustain high energy levels. Along with protein, such are also rich in Omega-fatty acids that promote heart health and lipid balance to give your dog healthy skin and shiny coat. 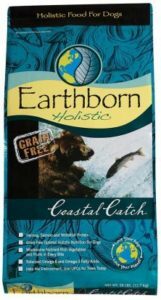 In addition, the Earthborn Holistic Coastal Catch Grain-Free dry dog food includes a healthy mix of natural fibers derived from berries and select vegetables. Know that berries have a wealth of disease-fighting antioxidants. Formulated without gluten or grain, the Earthborn Holistic Coastal Catch Grain-Free is an excellent diet for dogs with sensitive tummies. It is also ideal for obese dogs since it contains L-Carnitine that burns fat. It is imperative that your dog’s weight should adhere accordingly to his breed and age; otherwise, excess weight would strain his skeletal framework and hence cause joint pain and other obesity-related complications. 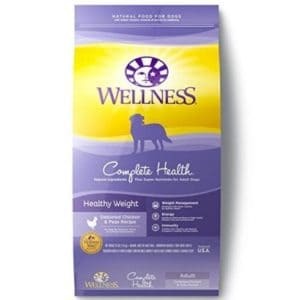 The Wellness Complete Healthy Weight dry dog food provides the nourishment that less active or overweight dogs require. Using fresh whole ingredients, its delicious recipe ensures full-body nutritional support with less calories to promote weight maintenance or healthy, weight loss. The Wellness Complete Healthy Weight dry dog food’s main ingredients are chicken and chicken meal. Know that chicken meal is a denser ingredient and thus contains higher animal protein. In addition, the main ingredients are complemented by apples, sweet potatoes, carrots, tomatoes, ground barley and ground flaxseed. Diabetic pets would definitely benefit from barley’s nutritional makeup and soluble fiber, ß-glucan. Most importantly, this product does not contain soy, wheat, or corn that regular dog food brands use as fillers. With its tasty flavor and nutritional value, the Wellness Complete Healthy Weight dry dog food will surely satiate your dog’s hunger and palate while supporting healthy weight management. The Blue Buffalo Wilderness Rich Protein Grain-Free Puppy dog food is inspired by a wolf’s diet and is specially formulated to meet the dietary needs of growing puppies. The reason why Blue Buffalo Wilderness Rich Protein Grain-Free Puppy is one of the best is simply because it features real meat: deboned chicken, chicken meal, etc. No artificial flavors or colors are added to its formula. Each bowl provides your puppy with high-quality protein that he needs to build strong muscles. The Blue Buffalo Wilderness Rich Protein Grain-Free Puppy also ensures that he receives the right amount of complex carbohydrates derived from vegetables to keep him energized. Like his wolf ancestors, dogs are omnivores and must also feed on plant sources for nutrition. In addition, this dog food contains the right balance of Omega-3 and Omega-6 fatty acids that promote healthy skin and coat; DNA for cognitive development; and antioxidants to boost your puppy’s first line of defense against common illnesses. Following the AFFCO standards, the Blue Buffalo Wilderness Rich Protein Grain-Free Puppy dog food is complete and balanced. It is also highly digestible since it is rich in fiber. When it comes to dog food, sometimes less is better especially for dogs who are often plagued by allergies, indigestion, and other GI issues. If your dog has food sensitivities, try the Natural Balance Limited-Ingredient Dry dog food. Its formula contains a single-source protein and limited carbohydrate sources to ensure that your dog receives a complete, balanced diet. This adult dog food uses duck as protein source paired with brown rice and potatoes for incredible flavor. Know that brown rice and potatoes are both fibrous and serve as highly digestible energy sources. Likewise, both are good sources of magnesium, selenium, and phosphorus. In addition, chick peas are added to augment its protein and fiber content. The Natural Balance Limited-Ingredient Dry dog food also contain omega-fatty acids to keep your dog’s skin healthy and his coat shiny. 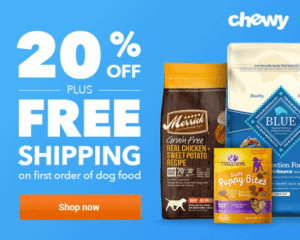 Most importantly, this product does not contain preservatives, artificial flavors or color so you can rest assured that your beloved dog stays healthy as he can be. When it comes to dining, fiber is essential. Hence, switching from cheap commercially-made dog food to a high-quality dog food would be best. High-fiber dog food is the loving solution for diabetic pets and porky pooches. Such are specifically designed highly digestible, which makes it suitable even for the most GI-sensitive pets. If you’re still reluctant, at least try feeding your dog a high fiber diet for two months and judge the difference for yourself. You may want to start with one of the six best high fiber dog foods listed in this article. Although fiber is essential for your dog’s health, take note that too much can also cause problems so it’s important that you monitor your dog’s daily consumption as well.